Harold Wilson never had to deal with this. In his day it was a piece of paper (not plastic). And will some nerd tell me who this particular J.C. is, please? Jody Clark. He’s a youngish-chap who won an anonymously-submitted portrait of Her Majesty. I still prefer Mary Gillick’s portrait. Naturally, this is the only one of the five portraits to no longer circulate. 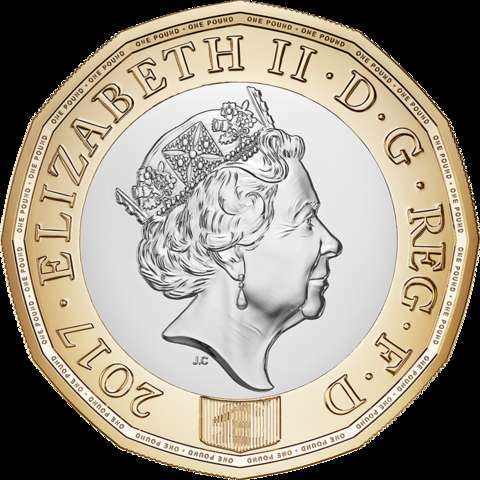 The £1 coin is a return to tradition, not an innovation. After all, the half-sovereign was worth 10/- and the sovereign £1. After standardisation, the Guinea was worth 21/- which I’m sure you’ve never seen in circulation, though perhaps Backside has! Oh alright. What is 3/5 of £3 in £sd? Now what is 13/15 of £235? I gather the pound is being replaced because the current is too easy to forge. I was surprised to hear they think 20% are forgeries. Wouldn’t have thought it worth it as they are worth so little nowadays. Wonder what it costs to make a forged 1 pound coin? When I was handed my first new fiver in change, the assistant told me cheerfully that these have already been counterfeited. Oh get on! The Canadians introduced plastic notes several years ago, they are a bugger to separate. Quite dreadful. Thank god for the greenback! I might be tempted to use bitcoins if I could begin to understand what they are. CO: Australia and New Zealand also use polymer notes. They only stick together when they’re extremely new. US banknotes are no better. I have had many issues with these ghastly things! I even prefer euro notes. Not that I like them, but they at least don’t stick together as much. I’ve had a couple of plastic fivers and no problem. Mind you, I’m not in the habit of carrying wads of cash. Yes, Jazz, Mrs J and I are virtually cashless.